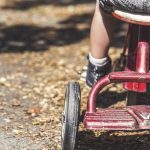 You’ve just come across the ultimate guide to the best scooters for kids at nearly every age, starting from toddlers all the way up to teenagers and 3-wheelers for older kids. Whether your child is a scooter pro or new to this thrilling toy, this guide will help introduce your family into this exciting world of push scooters. We have compiled our list of the best kick scooters for every age from toddlers to older kids, as well as our favorite teenager scooters and the coolest 3-wheel scooters for older kids. The last section will include a complete guide with everything you need to know about purchasing the best kids’ scooter for your family. This includes the types of scooters that are relevant for different ages as well as the features and benefits you should be on the look for when buying. NOTE: this article covers push scooters, that is non-powered ones. If you’re looking for advice on the best electric scooters for kids, please read this post. Now let’s kick off and get rolling with the best scooters for kids! Below you’ll find the two best scooters for toddlers, ages 1-3 years. These can help teach kids hand-eye coordination, balance, and depth perception from an early age. The Micro Mini Original Kick Scooter is one of the highest rated scooters because it’s fun, safe, and smooth. It has a lean-to-steer design, so your child won’t be making drastic turns if they move their hands too much. This also helps teach balance, and they’ll love leaning and turning in circles for hours on end (or until they get dizzy)! This is the best scooter for 2 years old because the deck is wide and gripped, and the three, large wheels add extra stability. The deck is low to the ground, so they’ll feel like they’re “surfing the sidewalk.” There is a gentle, back-foot braking system that allows them to gently come to a stop so they won’t bump into their handlebars. The wheels are non-marking, so you don’t have to worry about them riding their favorite toy in the house! It will even ride on carpet, so they can get the hang of it at home before hitting the streets! Parents absolutely rave about how quickly their children learn to ride the scooter, and they’re shocked at how easy it is for their kids to ride away so quickly! It has received many awards, like the ASTRA Best Toy Award 2014, Oppenheim Toy Portfolio Platinum, Parents’ Choice Award 2010, and so much more. Plus, it’s only a two-piece assembly, and it takes only seconds to put together! Your kids can be off and riding their new Micro Mini Original Kick Scooter in no time (with a helmet and knee pads, of course). >> Check out Micro Mini Original Kick Scooter on Amazon right here. This Micro Maxi Kick Scooter with T-Bar is specifically engineered to be super-durable for lil tikes! This is the best scooter for 3 year olds because it is made of high quality PU and 120mm wheels so it has a smooth glide without any head shaking. It has a wide, flexible chassis deck for a smoother ride and to help maintain balance for little ones. The deck’s flexibility means kids don’t need as much balance stepping on and off. It also helps form to the foot for better stability! The handlebars are one of our favorite parts of this Micro Maxi Kick Scooter. The T-bar allows for better balance for younger riders, but the rubber grips are comfortable to hold and steer with. This is not a stationary handlebar, as it pivots and tilts, but this scooter turns with lean-to-steer technology—perfect for older toddlers learning how to steer and developing their hand-eye coordination. The handlebar has an adjustable height from 24” to 34”, which is great for growing kids or multiple users. Plus, the handlebars are interchangeable! You can buy them as an additional accessory to make your own unique style! There is a wide range of colors of the Micro Maxi Kick Scooter: aqua, black, blue, purple, green, neon yellow, orange, pink, and silver. Everything on this scooter is replaceable, so you can own this scooter virtually forever! And the handlebars fold down for travel and storage! This is one of the best scooters for children to learn how to ride, because it’s easy to turn and intuitive to use. The braking design is especially effective, which gives parents peace of mind as their little ones zoom down the street—going double the speed their little legs could ever have dreamed of before! 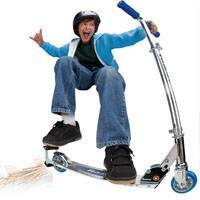 >> Check out Micro Maxi Kick Scooter on Amazon right here. These scooters are best for kids ages 4 to 8 years old. We have chosen these six scooters based on their fun, unique features, safety, their ability to grow with the child, and their capability to teach children important motor skills. When you think of a scooter, you probably think of the classic Razor A Kick Scooter. It has that sleek, traditional t-tube handlebar and deck design, which grew in popularity in the 90s—and they are even more popular with kids today! It’s made of sturdy aircraft-grade aluminum, and it takes a lot to scratch up one of these scooters! It has 99 mm inline-style urethane wheels with ABEC 5 bearings—basically that means these are really smooth, sturdy wheels that can take on a lot of speed. One of our favorite aspects of the Razor Kick Scooter is how easy it is to adjust the handlebars or fold it down for simple transport or storage. We also love that the colored wheels match the handlebars and deck logo—especially because this push scooter comes in so many colors! It’s available in blue, clear, green, pink, red, and even sweet pea (which has tassels on the bars)! This is the best scooter for 5 year olds, up to 143 pounds, because it’s great for speed and tricks, but it’s still safe and easy to use. It is not a lean to turn, but rather it’s steered by the handlebars. This is great for kids who want a little more control at their fingertips (and their hands are also protected by a comfort foam grip). The Razor Kick Scooter is not a stunt-scooter, though, so it still has limited mobility, which makes it great for 5-8 year olds. The Razor is the best kick scooter for every classic kid out there. >> Check out Razor Kick Scooter on Amazon right here. The Razor Black Label R-Tec Kick Scooter is the big brother to the Razor Kick Scooter. This Black Label scooter is “the future of street style,” with dynamic and exciting capabilities. The R Tec gives it a bold, sleek look with a matte black, futuristic design, while the red wheels give it a cool pop of color. It is made with an aerodynamic profile, including a single-sided fork and unique wheels and braking system. The two wheels are wider and thicker, making the classic push scooter even faster and more stable. These are super-wide 60mm urethane wheels, which means a smoother ride over bumps and cracks in the street. It is slightly noisier than the standard Razor because of these wheels, but it has less vibration and head shaking. The handlebars of the Razor Black Label are also made for added aerodynamics. Rather than a traditional T bar, this joystick handlebar feels like you are riding a bike, placing your arms at a more natural and comfortable position. These handlebars do not fold, but they are adjustable—so your child can grow into it (or mom and dad can take it for a spin). The integrated, low-profile fender brake makes this the best scooter for 6 year olds and older. The braking system is not a separate mechanism, and it is integrated directly into the thin, stylish deck. This allows for a smooth, connected braking system, but it’s also great for weight transfer. Older kids want to start doing more tricks on their scooters, and an integrated fender brake is perfect to start learning how to use your weight on the scooter in order to change speeds and movement. Plus, this scooter supports up to 220 pounds, and the adjustable handlebars are great for all size children. Your child will be ready to take on any bumps, cracks, and hills that come their way with this highly dynamic, sleek Razor Black Label R-Tec Kick Scooter. >> Check out Razor Black Label R-Tec Kick Scooter on Amazon right here. The Mongoose Expo Scooter is a more advanced scooter than what we’ve previously mentioned, which is why it’s the best scooter for 7 years old and older. This scooter is a mixture between a push scooter and a bicycle. This scooter has two, 12-inch tires with high-traction, made for paved and unpaved surfaces alike. It can travel over sidewalks, roads, and even grass and loose pavement! These are similar to small bicycle wheels, which allows them to travel almost anyplace a bike can go. It also has bike handlebars as opposed to a T bar or joystick configuration, which enables intense steering control and more turning leverage. On the handlebars is the hand-braking system, which offers confident speed regulation and smooth, settled braking. 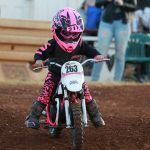 This is great for kids who may be in the process or learning to ride a bike, as the Mongoose Expo Scooter teaches the same principles of braking and balance. The wide deck especially enables stability while coasting. The BMX freestyle, 360-degree rotor and axle pegs make this scooter ready for tricks. Although not technically a “stunt scooter,” it’s a great learner scooter for kids who are looking for some added dynamics and moves to their ride. This Mongoose Expo Scooter is made for speed and agility on all kinds of terrain! >> Check out Mongoose Expo Scooter on Amazon right here. “Go pro and start to drift” with the Razor Siege Scooter. By appearance, this looks like a mixture of the classic Razor Kick Scooter and the Razor Black Label, but in function, it’s anything but the two. The Razor Siege Scooter is the ultimate and best kick scooter to take to the skate park to show off cool tricks and have a thrilling ride. It can ride like a standard scooter or twist, turn, and propel in different angles. The twistable top deck with hybrid-street technology enhances the turning performance, enabling safe, smooth, and incredible stunts. The Razor Siege Scooter is the best scooter for 8 years old, with a max weight limit of 143 pounds, because it’s both a traditional scooter and a stunt scooter. The T bar handlebars and the wider deck enable stability and balance, but the smaller, 360-degree inclined rear caster wheel gives unexpected movement. This push scooter is made for sideways drifting, but it has controlled movements with the front wheel and stationary handlebar that enable stunt-beginners to feel comfortable and safe. There isn’t a braking system, so kids use their feet to stop, which also allows for further control as they’re learning new tricks. Plus, it has a folding frame system with front wheel folding that enables it to be easily transported to new trick-territory. The handlebars are also adjustable, so it’s easier to move—and easier to grow with. The maximum height of the handlebars is 35” from the top of the handlebar to the deck, so it’s tall enough for older kids (and for many adults too). This Razor Siege Scooter will bring your kids on an exciting, unusual ride as they learn how to do stunts and tricks! >> Check out Razor Siege Scooter on Amazon right here. This Bikestar 12 Inch Kids Kick Scooter has the look of a bike, feel of a scooter, and dynamics of a stunt board! Designed in Germany, the steel tube frame and impact-resistant metallic paint finish give it a sleek, modern look that every kid will want to flaunt.This is the best scooter for 8 years old who are learning how to take their scooter-game up a notch. It has a skid proof footboard, which enables a safe and secure ride, and they can even practice indoors. Enjoy a smooth ride on these 12” air filled tires. They are lightweight, with high quality rims and splash guard fenders on both wheels. Because the wheels enable movement on different terrains, this is a great scooter for vacationing near the beach or on a campsite. The Bikestar Scooter has the functionality of a bike with quality wheels, but the weight and compactness of a scooter—perfect for bringing your fun with you! Plus, with a robust hand braking system, your child will have total control over speed and safety. It includes a functional side kickstand, so your child can stop to play and hop right back on without any delay. The handlebars have adjustable break handgrips with a protection device, which is good for small hands that lose grip easily. The steering wheel handgrips are also certified non-toxic, and it’s made with children in mind. You can adjust the handlebars using a wrench to ensure the scooter always matches your child’s height comfortably. This Bikestar 12 Inch Kids Kick Scooter is perfect for the traveling adventurer! 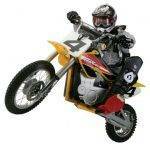 >> Check out Bikestar 12 Inch Kids Kick Scooter on Amazon right here. The following four scooters are for the advanced rider looking for serious speed and stunt capability. Whether they want to use it to get to school, to ride through the dirt, or zip through town, these units are the best kids’ scooters for the free, the independent, and the swift (aka teenagers). The classic Razor kick scooter has grown up into the Razor A5 Lux Scooter. With that same Razor style, this scooter is made for more intense riding. Designed and testing by professional scooter riders for durability, performance, speed, and excitement. It has an aircraft-grade aluminum T-tube handlebar and deck with cool coloring of blue, pink, or red. 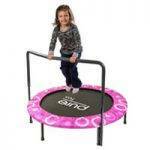 It’s great for older kids and young teens with a weight up to 220 lbs. The extra-large urethane wheels add speed and agility to the ride, while also creating a cool riding profile! The wheels and the thick deck together are great for curving around bends and turns. The Razor A5 Lux Scooter has a high-quality rear fender brake to ensure no abrupt, harmful stops. The handlebars are adjustable and include extra-thick foam grips for comfort and control. The blue model has a retractable kickstand, and it is easily folded up for transport. The Razor A5 Lux Scooter is perfect to give kids responsibility for their own scooter—and their own fun! >> Check out Razor A5 Lux Scooter on Amazon right here. This Razor Pro RDS Dirt Scooter takes you “off roading” with heavy-duty aluminum wheels made specifically for dirt! With high traction and tread, 200mm pneumatic tires, this scooter is the cousin to a dirt bike, a push scooter, and even a stunt scooter! The tubular BMX-style steel fork enables dynamic ride-ability and maneuverability that other traditional scooters can’t obtain. It has a rear fender brake, which is better for dirt because it gives more control over the back wheel. The deck has coarse grip tape to keep your teen standing upright as they twist and turn through the dirt and rocky terrain. It has a fixed riser Y-style handlebar at 30” in length. It has a triple stacked head-tube clamp for added durability and stability, even on the toughest of terrains. Plus, the soft rubber grips keep hands comfortable, even if they’re white knuckled with excitement! This is great for teenagers, up to 220 pounds, because it has all the feel of an off-roader but the convenience and ease of use of a scooter. “Go big, go pro” with the Razor Pro RDS Dirt Scooter. >> Check out Razor Pro RDS Dirt Scooter on Amazon right here. This Fuzion Cityglide Adult Kick Scooter is all about convenience. It’s made of a lightweight aluminum frame and weighs only 10 pounds, making it easy to pick up and carry when you get on the subway or run up the stairs to school. It also has an innovative folding system that folds the scooter in seconds, making storage and transportation that much simpler. The telescoping (T-bar) handlebars are adjustable, so you can easily shorten them for carry and quickly raise them back up when you’re ready to ride. The grips are soft foam and work to mold to the user’s hand. The deck of the Fuzion Cityglide is low to the ground and wide, which enables a smooth ride over pavement and gravel throughout the city—and beyond! The oversized wheels offer superior traction and durability, while also allowing quick speeds that will help you beat the bus route to school (while giving you great exercise). The large rear brake gives safe stopping power that comes to a nice, calm halt. This is great for teenagers of all ages, supporting up to 220 pounds, because it is sleek, simple, speedy, and convenient. “Glide through the city” without breaking a sweat with this Fuzion Cityglide Adult Kick Scooter! >> Check out Fuzion Cityglide Adult Kick Scooter on Amazon right here. This Rockboard Scooter looks like it’s from the future, and it functions like it too! It combines a traditional kick scooter with a drifting and shredding scooter, giving you twice the bang for your buck! The advanced Rockboard propulsion technology uses a steel power-drive chain to “rev up” to Rockboard mode for a thrilling, shredding ride. The rear spring-enhanced suspension creates a smooth ride on any and all terrains, allowing them to move and carve with little effort. If your kid feels like a more casual ride that day, they can simply adjust the two-position locking joint for a low-profile kick scooter. This is great for teens and older kids who want the best of both worlds: the functionality of a traditional scooter as well as the fun and excitement of a shredder. The tough, 200mm urethane wheels provide a smooth ride and even better traction for stability. It has nylon-reinforced spokes which are crucial for those stronger stunts. The handlebars are one of the most unique features. The entire bike folds for easy storage—including the handlebars. The handlebars adjust from 36 to 46.5 inches tall with the telescoping downpipe. It has a reinforced assembly system for added safety, and the hand brakes are made of aluminum alloy for secure control. The Rockboard Scooter is an amazingly smart, technological scooter for ages 8 and up, up to 200 pounds. Does the Rockboard Scooter sound familiar to you? You may have seen our Rockboard scooter review before. The full review will give you even more great info and help you decide whether or not this smart-board is right for your kid. >> Check out Rockboard Scooter on Amazon right here. Although 3-wheeled scooters are great to help toddlers with stability and balance, there are also 3-wheel scooters that are an advanced challenge for older riders! These scooters have 3-wheels, but they are not connected by the same deck. In this way, they actually lower stability to boost maneuverability with drifting, tricks, and speed. These 3-wheelers take riding to the next level between push scooter and stunt scooter, focusing on carving and movement. The Trikke T7 Carving Scooter is actually marketed as exercise equipment because it’s such an intense ride! But that doesn’t mean this scooter’s only for working out (although it does engage all muscle groups for a full-body fitness routine). This black and white scooter is great for kids ages 8 and up who have a need for a challenge and who want to carve through the pavement like a pro. It has a mid-size frame and an adjustable handlebar, making it ideal for growing, older kids. Kids will learn quickly with the polyurethane wheels, which ride smoothly and comfortably over pavement. The Trikke T7 is “convertible,” so they can always upgrade to more challenging wheels like larger polyurethane or air tires. This is the best way to advance and learn new skills safely, comfortably, and quickly. This product is high-quality and well-made, and your kids will be able to enjoy it for years to come. The only downside is that the unit is not easily transported. The front axle can be removed for traveling, but it takes some time and the whole unit weighs about 23 pounds. Nevertheless, the Trikke T7 is one of the best kids’ scooters (and adults’ scooters) for carving, working out, and an exhilarating ride! >> Check out Trikke T7 Carving Scooter on Amazon right here. The Razor PowerWing Caster Scooter lives up to its power-wing name with 360-degree spins and intense drifting power. The urethane wheels allow this 3-wheeler to glide over different pavements, but the smaller wheels in back are perfect for curving, drifting, and maneuverable speed. (The front wheel is 120mm and the back two wheels are 64mm.) The dual inclined caster rear wheels are made for turning and acceleration without ever having to even push—talk about a push scooter made simple! It also has removable stability bars in the back to help kids learn and feel comfortable before attempting the wilder drifting. The aluminum beam frame and wings give it aerodynamics worthy of an airplane, ready to cut through the air with ease. Plus, the design of the back deck matches with the wheels for a sleek, cool look that makes you want to fly away on this scooter. The hand break is sensitive and perfect for controlling all the high speeds the Razor PowerWing can reach. It has a folding mechanism for easy transport. Although it has an adjustable handlebar height, this scooter is made for taller kids, ages 6 and up, with a maximum weight of 143 pounds. This Razor PowerWing Caster Scooter is the super deluxe DLX size for added speeded, masterful drifting, and exhilarating spins! >> Check out Razor PowerWing Caster Scooter on Amazon right here. This 3-wheeled scooter creates a crazy and fun riding style that’s easy to learn and easier to enjoy! Standing or sitting, the Razor DeltaWing Scooter is a powerful and challenging scooter that really tests your balance! Made of a steel frame with high-tech polymer wings, this scooter is durable yet dynamic. It spins quickly and people love the thrill of drifting side to side on these low-angle trailing casters, which enable turning, drifting, and acceleration without even having to push. The back wheels are a large 125mm, while the front wheel is an XXL 406mm pneumatic, creating a powerful and smooth ride that kids will love. The three wheels of the Razor DeltaWing are larger than many of its scooter counterpoints, which is less aerodynamic but definitely more thrilling and offers up more tricks and coasting options! There are also comfortable footholds that give stability on a traditionally unstable scooter-type. Similarly, the handgrips are comfortable and functional with the hand-operated braking system. It has a 2-piece Y drop handlebar, perfect to maintain balance as the back wheels go wild! The Razor DeltaWing Scooter will hold up to 143 pounds for ages 6 and up, and everyone will enjoy balancing and flying on this non-push push scooter! >>Check out our Razor DeltaWing review. >> Check out Razor DeltaWing Scooter on Amazon right here. If you type “kids’ scooters” into a search engine, you’ll find such a broad range of types and styles that you won’t even know where to begin! 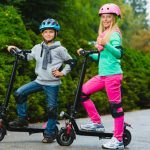 In this guide, we will discuss the types of scooters for different age groups as well as what features to pay attention to when purchasing the best scooters for kids. When you think of a scooter, you probably think automatically of a kick scooter or a push scooter. These are manually powered, foot to ground scooters that move based on how quickly the rider motorizes with his or her foot. They have a handlebar, deck, and wheels (two, three, or four wheels), and they are often made of aluminum, titanium, and steel. They can be foldable or stationary.The best kick scooter tends to have adjustable handlebars to grow with your child and an appropriate deck length and number of wheels, which depends on the comfort of your child. We will later go through the different features of buying scooters, and you can determine what will work best for your child’s needs. There is no right or wrong when it comes to the traditional kick scooter. Stunt scooters are specifically designed to be sturdy and lightweight so the rider can use it to perform tricks and stunts. These tend to be stationary with two wheels and a maneuverable deck design. Stunt scooters for the skate park are lighter, thinner, and have softer wheels in order to focus on agility; street stunt riders, on the other hand, tend to have larger and steadier scooters that can travel comfortably and smoothly over the pavement.It is important to note that we did not include stunt scooters in this guide. 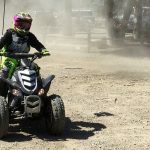 We include this because if your child is interested in doing stunts and tricks, you will want to look at our guide specifically for stunt scooters! Stunt scooters are different than dirt and adult scooters, as they are built with a different function in mind. However, we included scooters for teenagers and 3-wheeled scooters for older kids, which are drifting and carving scooters. The best scooters for toddlers are engineered for stability above all else. 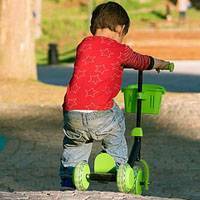 Toddlers are still learning motor skills, so scooters can help them with coordination and balance—but you still want them to be safe. Stability best comes with three, large wheels and a smooth back foot braking system that won’t jostle them when they push back. New learners have a tendency to “ride the brake,” so you really want to focus on the braking system’s ease of use. You’ll also want non-marking wheels that work on different terrains (including rugs and carpets), so they can practice at home before hitting the sidewalk. Wide decks that are low to the ground will feel more secure to the child, and they will better be able to control their balance. They’ll feel like they’re right on the sidewalk, which adds power and even more dynamic fun with their speed! Flexible, fiberglass reinforced decks are soft and help with toddlers’ balance. The best kick scooters for toddlers have a T-bar handlebar as opposed to a joystick. The T-bar is more stable and secure, while the joystick is better for older children who feel more comfortable turning. We also prefer a lean-to-steer technology as opposed to handlebar-controlled turning, because toddlers have less control over their hand-eye coordination than their full-body balance. You may also want an adjustable height steering stick, so your child can continue to use it as they grow! For the best protection for toddlers (and all kids), we definitely recommend the use of helmets and kneepads. Three-wheels is better for younger children for added stability and balance, and they can then “graduate” to two wheels. Polyurethane wheels are the traditional scooter wheels, and they can come in a variety of sizes. The larger the polyurethane wheel, the more stability and durability it will have. These are kids looking for that traditional scooter look, feel, and ride. Scooters can also have air-filled tires, which are for rougher terrains and faster speeds. There are foot/fender brakes as well as hand brakes. Foot brakes tend to come on scooters better suited for younger kids, because it is more natural and gives kids who are just learning more comfort as they learn about speed. However, it can sometimes cause more “shaking” and abrupt stops. Hand brakes are for older kids who want more control over their scooter, and hand brakesare great for teaching hand-eye coordination. Stationary handlebars tend to be for younger children, accompanied by lean-to-steer technology. Handlebars that pivot and steer the wheels are for kids who are learning to control their push scooter themselves and want to be able to turn and do tricks with ease. There are T bar handlebars, which are better for learners, joystick handlebars, which arebetter for curving, and bike handlebars, which are better for speed and stunts.Most of the handlebars on our list are adjustable, so the scooter can grow with your child or it can be adjusted based on the child using it. You also will want to take into account the grips on the handlebars: are they made of foam or soft rubber, and will your child’s hand easily and comfortably fit around it? Although some scooters are better suited for some age groups over others, most scooters also have a maximum weight limit based on the wheel and deck type. Because of this, you’ll want to ensure that your child is significantly under the weight limit so they can use their scooter now and in the future. At some point, they will grow out of it, but you want to ensure they get their use out of it now! Is it adjustable and foldable? Not all scooters need to be foldable, but if you plan on using your scooter on vacations, trips, or even storing in a small space, you will want to ensure that your scooter can go from a horizontal deck position to a vertical one.You should also consider durability of the frame, the look of the bike, and your child’s use of the bike, whether it be to learn how to ride, to race their friends, or to show off at the skate park. Similar to how you would choose a scooter for a toddler or a child, choosing the best scooter for your teenager depends on what kind of riding they plan on doing. Most teenagers have two major purposes of scooters: to do fun, cool tricks and to travel from one point to another. With this in mind, you want versatile scooters that can do both! There are three key points to focus on in this regard. You want an easy, simple, and fast folding mechanism. This will allow your teen to unfold it quickly, hurry off to school, and pack it up to store in their locker while they attend class. This convenience is crucial to teens. It’s important to note that if your teen is looking to do skate park tricks above all else, true stunt scooters tend not to be foldable. The wheels and deck are also important. What kind of wheels does the scooter have—pneumatic or polyurethane? How big are the wheels? On what kind of surfaces will it provide traction: grass, dirt, gravel, pavement, indoors? Understanding how and where your child is going to ride will narrow your search based on the wheel type. Finally, what is the maximum height and weight the scooter can support? Teens grow quickly, and you want a scooter that will be able to handle their unexpected growth spurts. There are 3-wheel scooters for toddlers just learning to balance and ride, and then there are 3-wheel drifting and coasting scooters for the more advanced rider. These 3-wheel scooters are great for working the core while developing balance and hand-eye coordination. Similar to the other scooter types, you want to look at the folding mechanism type, the wheel size and type, and the maximum height and weight. The purpose of a 3-wheel scooter for kids, though, is often to get a new type of ride than the typical straightforward movement—they want spins and turns with their scooter! The best kids’ scooter is the one that will give them the most options. Thus, you also want to look at the type of ride that the 3-wheel scooter will give you. Is it made for drifting, spinning, carving, or skating? What is the speed you can achieve? With many of the wheel materials of these scooters, acceleration comes directly from the back wheels—no foot pushing necessary. This saves energy while focusing on fun! Remember: all kids should wear a helmet, kneepads, and elbow pads—especially under age 10. 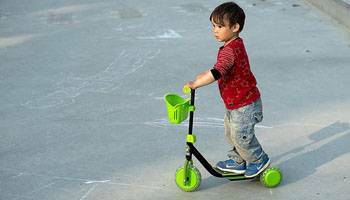 From 3-wheeled toddler scooters to advanced 3-wheelers, and from kids to teenagers, there are tons of options when choosing from the best scooters for kids. Take into account your child’s age, level, and riding needs to narrow down the ideal kick scooter for your family. The best toddler scooter has stability and functionality, while older kids may prefer more maneuverability and speed. Older kids and teens often want versatility with their scooter, so they can use it to get to their friends’ house—and then also race and drift with their friends once they get there! 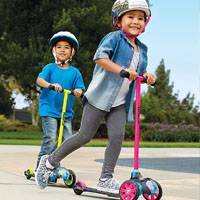 The best scooters for kids will offer your family dynamic, exhilarating, thrilling, and functional fun! So get out there and ride!